An important branch of organic chemistry is concerned with compounds with functional groups containing nitrogen and oxygen. These may be nitro compounds, nitroso compounds, or oximes. Organic nitro compounds are formed by nitration. Nitration is the means by which a nitro group (a molecule containing one nitrogen atom and two oxygen atoms) is added to a hydrocarbon, generally by using ni­tric acid. Nitroso compounds are those that contain a molecule consisting of one nitrogen atom and one oxygen atom. Important related compounds are the nitrosamines. action between an aldehyde or a ketone (car-bonyl group, discussed in a previous article) and hydroxylamine (a colorless, crystalline base similar to ammonia). In a condensation reaction, two molecules link together, usually with the expulsion of a small molecule, such as water or ammonia. Oximes may be aldoximes (derived from aldehydes) or ketoximes (de­rived from ketones). Both have a carbon-nitro­gen double bond. Oximes are used to isolate and identify car-bony! compounds. Some are important indus­trial chemicals. Aldoximes may be dehydrated to nitriles, and ketoximes may be reduced to primary amines. Oximes may be used to make carbonyl compounds or hydroxylamine salts. The process used to make these compounds or salts is sometimes difficult, because oxime formation is reversible. To prevent this from happening, formaldehyde is added to give a very stable oxime. Ketoximes may be reacted to make amides. Such a reaction is used in the formation of caprolactam, an intermediate (middle step) in the manufacture of Nylon 6. Organic nitro compounds are derived from hydrocarbons, having nitro groups with nitrogen-carbon bonding. Nitration, the reac­tion that makes a nitro compound, is usually achieved by using nitric acid. Some nitro compounds—the nitroparaffins—are relatively acidic and can be used as solvents in dissolv­ing other substances. They are also important in organic synthesis, the artificial production of organic compounds. Aromatic nitro compounds, known for more than a century, are chiefly used as dye intermediates and as explosives. They are formed readily by the reaction of aromatic hy­drocarbons and nitric acid. Examples are trini­trotoluene (TNT) and picric acid (trinitrophe-nol). The most important synthetic reaction of the aromatic nitro compounds is reduction to aromatic amines. An example of an aromatic amine is aniline, which is used in making dyes, perfumes, certain medicines, plastics, and res­ins. Nitrobenzene is an important industrial product. It is used as a solvent in dissolving other substances and to synthesize (produce artificially) aniline. Nitrotoluene is also an im­portant derivative. It is used in the manufac­ture of trinitrotoluene (TNT). Nitroglycerin is another high explosive, although not a true nitro compound and not an aromatic. It was considered too dangerous to use until Alfred Nobel (1833-1896) found a way to stabilize it, absorbing it in a claylike mineral to make dy­namite. Compounds with the nitroso group are rather rare. This is because many primary and sec­ondary nitroso compounds readily change in an acid or base into oximes. Tertiary deriva­tives (a third type of nitroso compound) have a bluish color in the gas phase, as they do in a dilute water solution. They are colorless liq­uids in the pure state. Many explosives,includ­ing detonators, propellants, and warheads, are organic nitrogen compounds. One of the major high explosives for military use is TNT(trini­trotoluene). 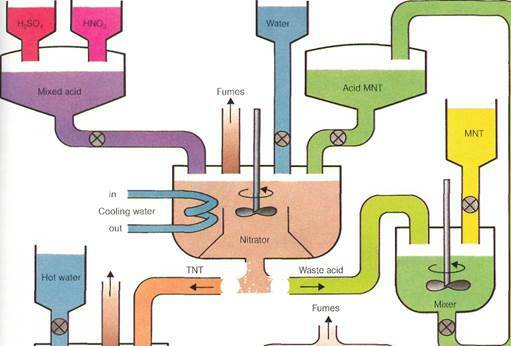 The diagram shows an industrial process for the continuous produc­tion of TNT from MNT (mononitrotoluene). The process begins in the upper left corner of the diagram, using a mixture of sulfuric acid (H2S04) and nitric acid (HNOJ. 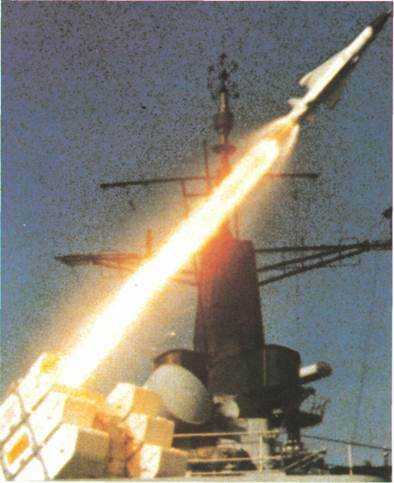 Modern missiles,such as Seawolf, were developed as naval antimissile missiles. They usually have warheads containing nitro-explosives. Many military explosives are mixtures, often containing TNT, chosen to be insensi­tive to heat and shock ex­cept when deliberately det­onated. matic amines, the nitroso group generally at­taches to the ring-carbon atom. With aliphatic amines, the nitroso group joins to the amino nitrogen atom to form an N-nitrosamine. Often causing cancer in animals, the effect of nitrosamine compounds on humans has been extensively studied. Nitrosamines can cause cancer under certain conditions. As a re­sult, the U.S. Department of Agriculture limits the amount of sodium nitrite allowed in cured meats. These nitrosamine compounds are used because they prevent the growth of mi­croorganisms responsible for the type of food poisoning called botulism. Nitrites are also produced by reduction of nitrates in saliva. Both nitrites and amines are formed by bacte­rial breakdown of proteins in the intestine. Thus, more nitrosamines are probably formed in the body than are eaten. left) contain an — SH group.